“Villa Na Mara” is situated on the French Riviera close to the village of Boulouris, which is 3 km from St Raphaël on the coast road between St Raphaël and Cannes. 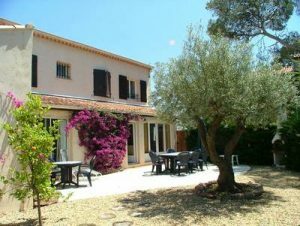 The Villa Na Mara is classified as a 4 star seasonal rental on the Tourist Office website of Saint Raphaël. St Raphaël is halfway between Cannes (35 km) and St Tropez (30 km), one hour drive from Nice, and 1h30 drive from Monaco to the East and 1h30 drive to Aix en Provence to the West. Spring and Autumn are among the best times to enjoy the Riviera as it is less busy than in high season and the temperatures are very pleasant. “Villa Na Mara” is divided into 2 separate self contained apartments available for rent. “La Mer” is the upstairs apartment and “L’Olivier” the downstairs apartment. “Le Palmier” studio is rented with the “L’Olivier” downstairs apartment. The property is fully landscaped and has its own 27°C heated swimming pool shared between the 2 apartments. “Villa Na Mara” is 5 minutes drive from large supermarkets and shopping centres. The nearby town of St Raphaël offers a very wide selection of shops, amenities, cultural centres and car parks all year round.